Who hung this--a 40 year first--on my Berkeley Telegraph Ave. beat? At fifteen square feet, this newspaper beat could be the smallest in the world. 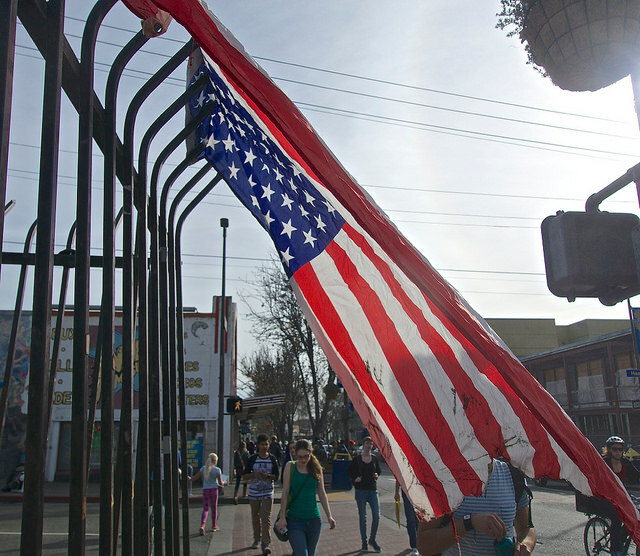 To worsen matters, there’s not much really happening here at Telegraph/Haste, the host of Telegraph Avenue. 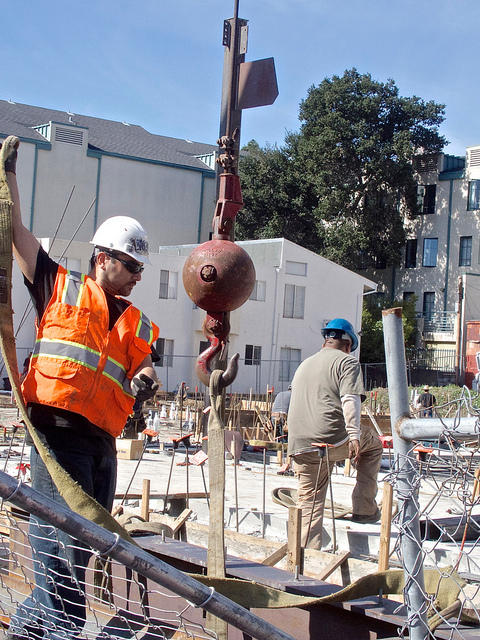 Two TeleHaste construction projects–vital to the survival of lower Telegraph–are clanging and buzzing forward. Progress at Telegraph/Haste. Photo by Ted Friedman. What seemed a police crackdown on the Zebra Scene–sputtered. 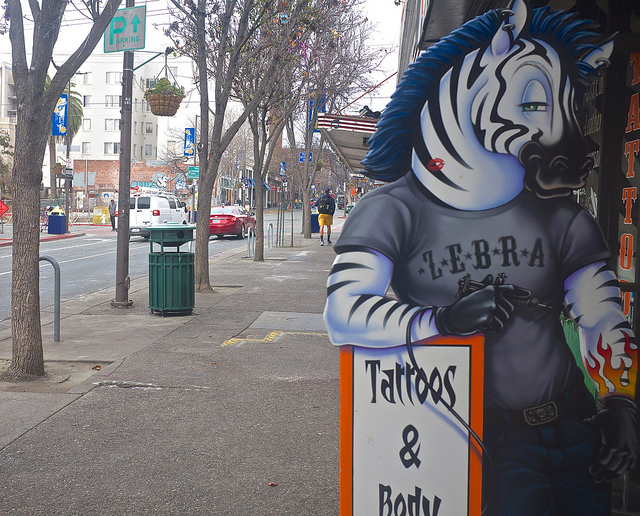 [The Zebra Scene is a group of regular street hanger-outers out side Zebra, a tattoo and head shop.] But not before the cops and ‘the kids’ played cat and mouse for days. Then the kids reclaimed their out-side Zebra position. Cop crackdown begins. Photo by Ted Friedman. 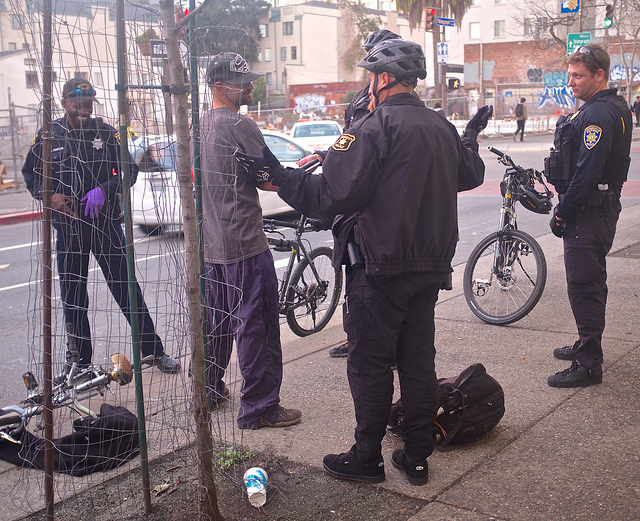 Years of watching cops making the avenue nice for Cal Parents during upcoming parents’ day, reveal a pattern. 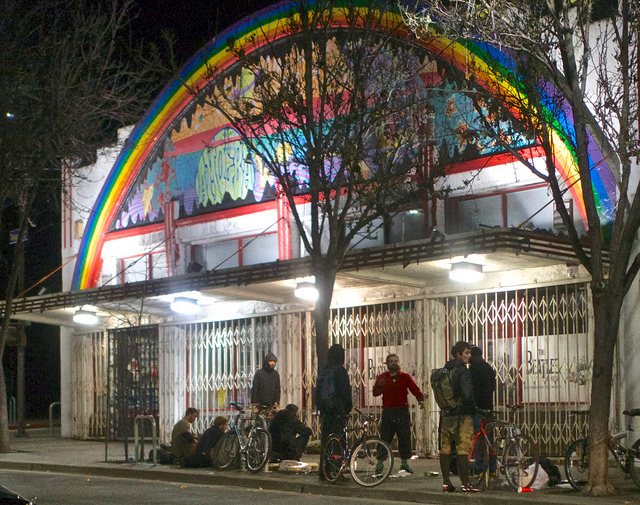 During Cal’s winter break, Telegraph Avenue is owned by street transients, but as the parents’ arrival nears, police bear down. Street kids outside Zebra cleared out by cops. Photo by Ted Friedman. Ironically, street kids are the only ones who can afford to live here anymore. Street kids return at night; shift from Zebra to Amoeba. Photo by Ted Friedman. Wrong way cyclist at TeleHaste, caught in recent cop crackdown. At the Caffe Mediterraneum–one of the oldest Berkeley businesses standing–still another cat-and-mouse game played out. The Med has been for sale for months. 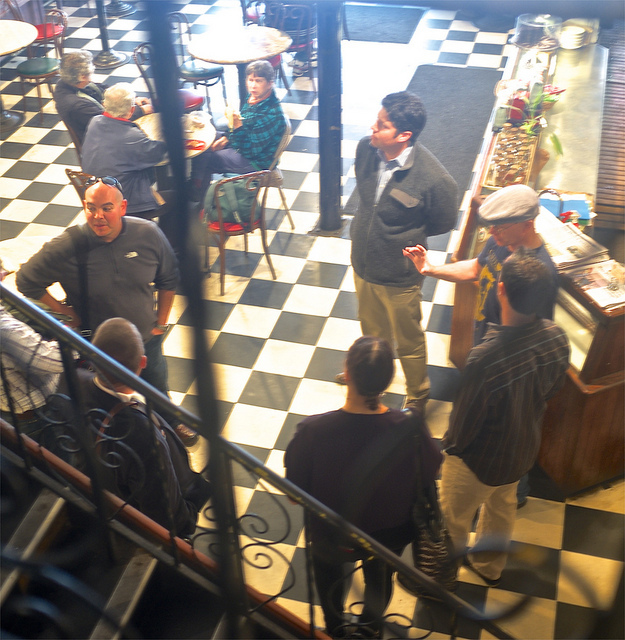 A recent prospective buyer’s tour, conducted by one of Berkeley’s leading realtors, played the mouse and Craig Becker, owner of the Med, may have been the cat. Prospective buyer's tour Cafe Mediterraneum. Berkeley Reporter immediately spotted the buyers with their agent, as they entered the door of the Med. One of the buyers, asked, “are you an old-timer here?” (I’m an old-timer anywhere) “Since 1972,” I boasted. “I guess you’d hate to see the Med be sold,” the buyer speculated. I tried to be as inconspicuous as possible when photographing the buyer’s tour. Owner Becker even gave the buyers a look at his Poe-esque pit-and-pundulum office, a scene that so astounded me that I got a shaky shot. Becker’s cluttered office is not more than four feet wide. 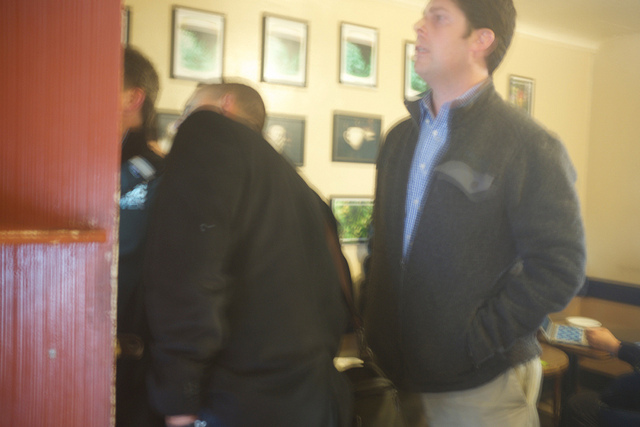 Shaky shot of shaky buyers peeking into Med owner's office. Afterwards I saw my buyer buddy with his fellow buyers outside Telegraph’s the Melt, now a burger-joint. “Did you buy it? I asked. “No,” he said. Becker bounced back a few weeks later, boasting the Med was about to become a Chinese tea-house (“Oh, they’ll have coffee, too, of course,” he added). Becker was quickly back to our table to put things in perspective. He was flat wrong about the tea house, he said, but we wondered what would become of our dwindling ranks of old-fashioned Med-Heads if we were about to be sold. And why had Becker told the tea-house tale? I guess I wouldn’t want the Med to be sold, but to whom? Paris Baguette, downtown, is a South Korean coffee house/pastries bake with a large network in South Korea, which is. reportedly, coffee-mad. What if they bought the Med? Immediately, the Med pastries, based on inspired baking from Rehelio, would be augmented and Paris does a credible cappuccino. But what if the Med became a Chinese tea house (with or w/o coffee)? To Med-heads, literally a dying breed, such speculation is meaningless. Our Med Head lives are on the block. For more than half a century, the Med has been a cheap Telegraph Avenue spa/vacation spot. For the price of a cappuccino. Could this be the end? But what if even ‘nothin’ went away? 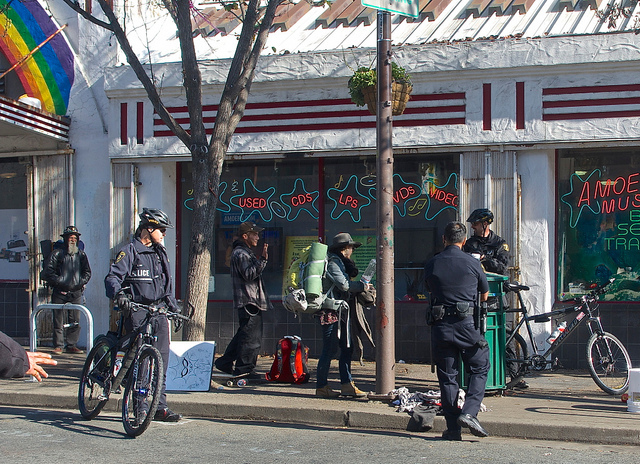 This entry was posted on Tuesday, February 17th, 2015 at 7:31 am	and is filed under Telegraph Avenue, The Berkeley Scene. You can follow any responses to this entry through the RSS 2.0 feed. Responses are currently closed, but you can trackback from your own site.